Get ready to be WOW-ed!!! 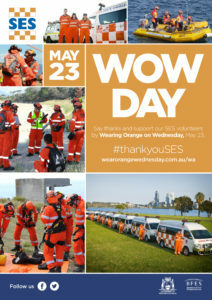 The SES is painting the town ORANGE for Wear Orange Wednesday (WOW Day) on 23 May 2018 and we want you to join in the fun. We encourage everyone to wear orange on 23 May 2018 to celebrate and show their support of the hard work and dedication of SES volunteers. A number of iconic locations across the State will be lit up in a magnificent orange in support of the SES volunteers, including the Bell Tower, Elizabeth Quay, Parliament House, Yagan Square and Perth Concert Hall. Why not also take a drive by the Swan River in Nedlands to see how the Eliza Statue is showing her support?